It doesn’t really matter how many times you tell the story – it’s worth repeating again. 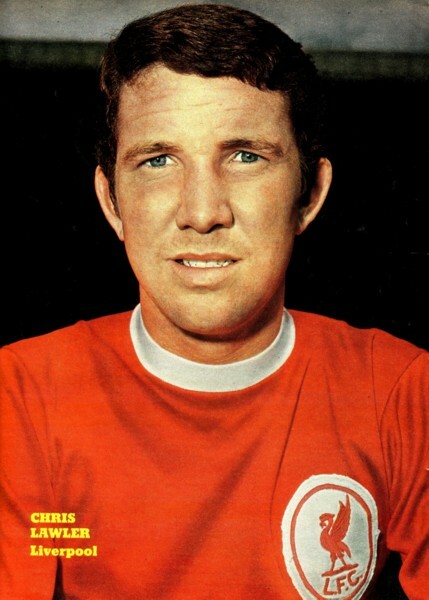 It‘s the one about the quiet man of Anfield, Chris Lawler, and his former boss Bill Shankly. Bill used to take training sessions very seriously when it got round to the 7–a-side matches and this day we were playing without proper goals. Bill hit a shot and claimed a goal which everyone else knew would have gone over the bar. Anyway, to try and get some support for his view that he had scored he turned to Chris and asked him whether it was a goal or not. Chris said that it wasn’t and would have gone over the bar and Bill had everyone in stitches when he turned round and told anyone who would listen: “He doesn’t say a word for years and then when he does he tells a lie.” That, really, shows how quiet and efficient Chris was during his days at Anfield. He used to room with Tommy Smith but you would never have thought it the way Tom would give him a rollicking during a match. But you’d never see Chris raise his voice because that was his way. On and off the field he was quiet but he was certainly no push over and underneath that calm career was a will of steel. He was a local discovery, having been first spotted while he was playing for St. Teresa’s School and he was obviously heading for the top. As a schoolboy he played mostly at centre-half and represented Liverpool, Lancashire and England Schoolboys before he joined us as an apprentice. He shone out then as a cultured centre-half and he won many admirers among those fans who used to go regularly to watch the reserves. But his way into the first team was barred by the commanding figure of Ron Yeats. He was the natural understudy to Big Ron and made his debut in the First Division against West Bromwich Albion when he was only 19. I think everyone at the club knew that the time come when we would have to find a position in the first team for him because of his exceptional talent and it finally came when Ronnie Moran was reaching the end of his long first team career. Gerry Byrne had been playing at right back with Ronnie on the left so when Ronnie dropped out it was decided to try Gerry on the left and bring in Chris at right back. He was to make that number two shirt his own and, while he had the occasional match as Yeats’ replacement in the centre-half position he adjusted superbly to his new role. He put together a run of 239 successive First Division matches and played nearly 550 senior games for the club in thirteen seasons. Quiet off the field – he was a ghost on it. He had the brain of a striker and could always find himself in goal-scoring positions. Discounting his first campaign, when he played only half a dozen times, he scored in every season he was in the first team and, in 1969-70, actually finished as our second leading scorer in the League. He got 10 goals that year, and only Bobby Graham with 13, scored more than him. It wasn’t even as if he got them from dead ball situations – all but the odd one or two were scored in open play. As far as Liverpool were concerned he never recovered from a bad cartilage operation – he did it in a game at Queens Park Rangers in November, 1973. He came back for a few matches the following season but could never regain his regular spot and finally moved to Portsmouth within two years of the injury. He was signed by one of his former team-mates Ian St. John, who had taken over as Pompey’s manager, and played only 35 matches for them before ending up with Stockport County for a short spell. After spending some time as assistant manager at Wigan Athletic he returned to Anfield for a testimonial at which 20,000 fans paid tribute to him and he was then offered a job on the staff and coached the reserve team to two Central League titles. Sadly, his career at Anfield ended when he became the first member of the backroom staff to be sacked since Shanks' arrival in 1959 when he vas given three months’ notice in August, 1986 and replaced by Phil Thompson. "He's a lad who actually enjoys running. He's like one of those toys with the long-life batteries. You just switch him on, put him down the pitch and watch him go! Our Anfield Aussie has had a crack at just about everything. He's an avid photographer, he takes guitar lessons, he's learning an extra language, he's written a song and directed a video to go with it. I'm half expecting to into training one morning and tell me he's just come back from the moon!"